Oculus Rift owners will soon get to experience what it's like to be an average, everyday stereotypical super spy. Over the years the developers at Twisted Pixel have made a healthy smattering of titles that run the gamut from quirky and zany platformers to pulse-pounding thrillers. With such an eclectic catalog it can be hard to even guess at what a new IP from their team might resemble. While I had a few colorful ideas in my head as to what a new VR title from Twisted Pixel might be, there was no way I could’ve seen the Defector coming my way. 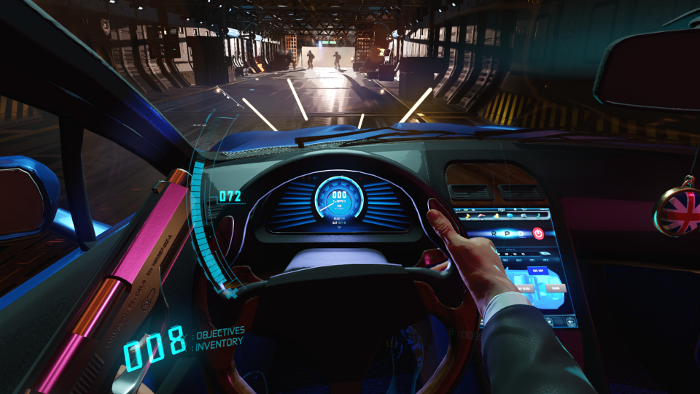 Simply put, the Defector is a VR experience that will put players in the role of a secret agent in a series of intense missions. Throughout each mission, there will be several moments where decisions will have to be made that will have an impact on various aspects of gameplay. I got a chance to put on an Oculus Rift and go hands-on with a PC build of the game and hone my observational and combat skills. The demo began in a bathroom on a private jet, where my spy persona was preparing for the task at hand. Right off the bat, Defector augments players with high-tech gear and has you slip in an AR contact lens that can provide dossier information on targets as well as point out objects of interest during certain scenes. At certain points, players will get a chance to obtain other items that can make situations that might occur later on easier to deal with, like a ring you wear that can shock people. Along with the high-tech gear that players will have at their disposal, would-be spies will have to rely on their wits and physical skills throughout the game. During my mission, I had to use my conversational skills to manipulate my target and convince them I was a buyer interested in procuring their contraband. If I was successful I would get more time alone in the meeting room to explore for clues, items or information. The first time through I was able to use the info I gleaned from the villain’s dossier to pick the right dialog tree to follow and I was able to get 60 seconds alone in the meeting room to search his safe or briefcase and get back to my seat. My second time through though I messed up and only got 30 seconds to look around. From the initial Dr. No-style conversation things were ready to take a more action-oriented twist. After securing the arms dealer with the help of my partner who had been working undercover I came to a fork in the road where I could either jump out of the plane with them or staying on board to take care of business. I just happened to choose to stay on board, but if I hadn’t I would’ve been treated to a whole different scenario of objectives including having to climb the wing of another plane as I attempted to board it. But my path was still action-packed nonetheless. After my partner jumped off the plane with the suspect, it was time to shoot my way through everyone I had walked by on my way to the meeting. A well-placed shot from my sidearm into a fire extinguisher sent my first target flying to his doom. After that, it was a frantic shootout between me and the remaining grunts to get from one side of the room to the other without dying. 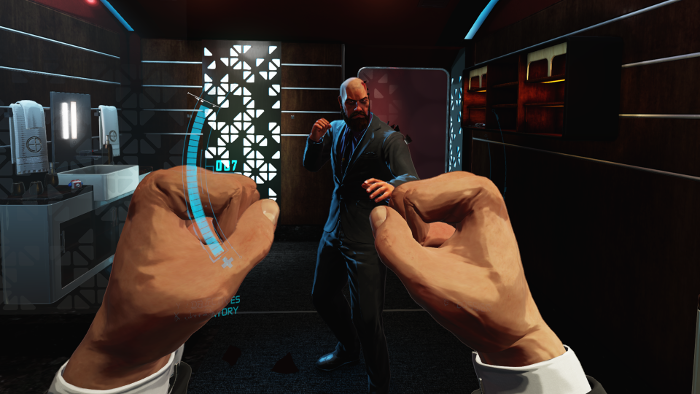 Shooting a gun in Defector using the Oculus’ touch controllers is a very visceral experience. Players will have to aim accurately and drop empty clips before reloading with a fresh one from the hip region. It took me one or two tries to get through the room, but once I was on the other side I was met with a rather large hurdle. In order to get through the next door, I’d have to take on a very big tough guy in hand-to-hand combat. Hand-to-hand felt like a VR version of Punch-Out. Players will have to block attacks and throw actual jabs and hooks to take down opponents. There will even be a few moments where players will get to grab their target and throw them into various fixtures around the room before the final knockout. After my brief tussle, I took the unconscious bruiser’s key card and made my way to the cargo hull. After flipping a few switches in the hull it was time for me to make my final escape which involved hopping behind the wheel of a sports car, driving off the plane through a few leftover goons then leaping out of the car mid-air and somehow miraculously ending up flying right into another plane’s awaiting open door. 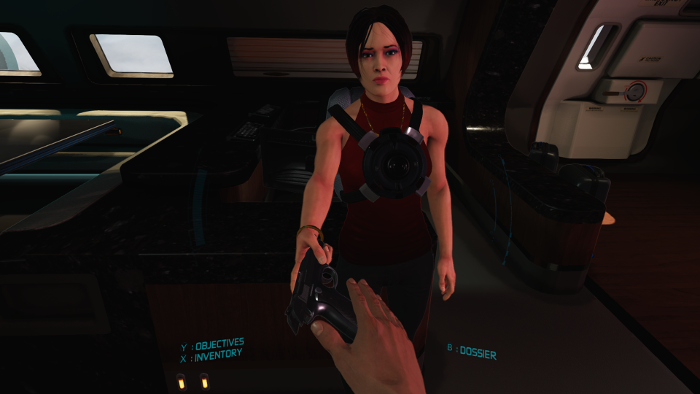 My overall impression of the Defector after my hands-on time with the demo was fairly positive. I felt like it took some of the cooler aspects of Rare’s Golden Eye and Perfect Dark titles, updated them for a VR experience and dialed back some of the more ambitious branching path features of Alpha Protocol while adding a healthy amount of homage to the spy film genre. I did have some trouble getting the hang of aiming and shooting at first, but by the time I was done with Defector I wanted to go back for more and see how else things could’ve turned out. You can check out my gameplay footage below to get a better idea of what to expect when the game launches. Defector is set to launch later this year for Oculus Rift but does not have a specific release date just yet.